On 3. 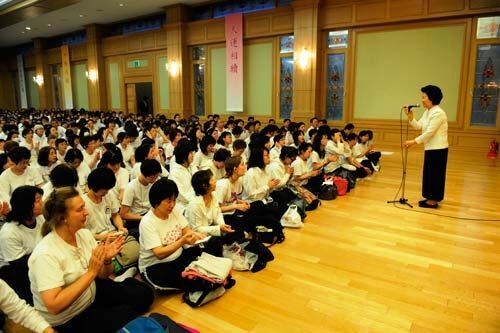 24 by the heavenly calendar, 1st year of Cheon Il Guk (May 3, 2013), the Starting Prayer for the '2013 Purification Azalea Festival for the Inheritance of Heavenly Fortune' was held at 5:40 am at Jeongshim Won Prayer Hall with Dae Mo Nim and many members. It has been a tradition for Dae Mo Nim and the staff of Chung Pyung Heaven and Earth Training Center to hold a starting and finishing prayer but from last year Dae Mo Nim invited the members to hold this precious hour. After the opening prayer by Rev. Yeong-ho Ha, President of Chung Pyung Heaven and Earth Training Center, Dae Mo Nim came to the front and spoke some words. 'True Father said that he will be here during this Special Great Works and instruct all the absolute good spirits to liberate spirits from members. He instructed that all the spirits in the spirit world would come down to Chung Pyung. This 2013 Purification Azalea Festival will be a time to remove evil spirits from your body so that you could fulfill your responsibility of witnessing for the victory of Year 2020. It will also remove your fallen nature so that as people of Cheon Il Guk, we could all live beautifully and happily as role model in front of our relatives and neighbors. After her 10 minutes speech the members who filled the Jeongshim Won gave a warm applause to Dae Mo Nim who had to leave and welcome True Mother back to Cheon Jeong Gung Museum. Then after singing a holy song the members offered a sincere prayer for the victory of Year 2020 and for the great grace to be received during the Special Great Works.